After Council Vatican II, Joseph Ratzinger - then a priest and today a Pope - wrote a 20-page collaboration for the book The Great Themes of the Council. 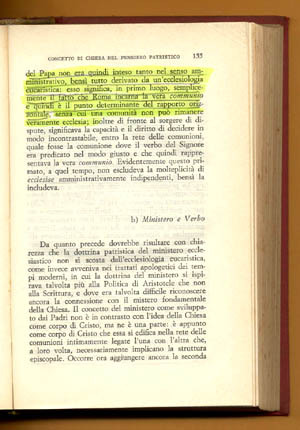 In it, he displayed his interpretation of the concept of Church in the Patristic Age. The topic is interesting since it gave Fr. Ratzinger the opportunity to defend his own notion of the Papal Primacy. He defended that the fundament of the Church is not the Papacy, but rather all the Bishops. Therefore, the Papacy should be leveled to stand at the same height as the other Bishoprics. The Sovereign Pontiff should no longer be raised above the other Bishops, with a transcendental difference between them, but should only be a horizontal central point of unity. This is how he understood the Papal Primacy in a "Church as communion," an expression increasingly in the pontificate of Benedict XVI. We reproduced here the excerpt in which he defended this idea. Indisputably it sheds light on the plans Benedict XVI has to transform the Papal Primacy. 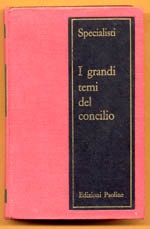 Top right is a facsimile of the book cover; at right, a photocopy of the Italian text. Below, we present our translation. "The Church consists of many churches in communion among themselves; the network of communion that the Church thus forms finds its fixed points in the Bishops: as the post-apostolic continuation of the Collegium Apostolorum [College of Apostles], they are responsible for the purity of the word and communion. "The Primacy of the Pope was not understood, therefore, in the administrative sense, but was wholly derived from a eucharistic ecclesiology. 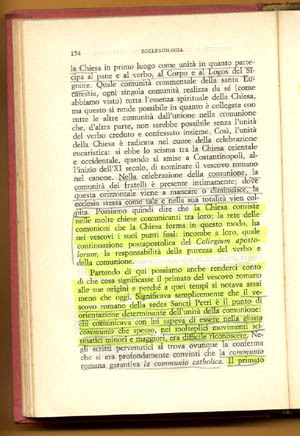 This means .... that Rome incarnates the true communio and, therefore, is the determining point of the horizontal relationship, without which a community cannot remain truly ecclesia"
(Joseph Ratzinger, "Il Concetto della Chiesa nel Pensiero Patristico," in I Grandi Temi del Concilio, Rome: Paoline, 1965, pp. 154-155).